As the temperatures cool down, I start using my crockpot more. Stews, soups, and all sorts of delicious meals that I can pop in in the morning, and have ready by dinner time. I haven't always had the best of luck with slow cooked meals though, for a long time, or rather I should say, when I first started using one, I couldn't get it right. The food seemed to be bland, or it was really watery, or sticking to the sides. It was always something, but as the time went on I became more confident and actually started the Slow Cooking Thursdays over on my main blog. Since then, I have made so many good meals in the crockpot, and am still to this day enjoying trying new ones out. 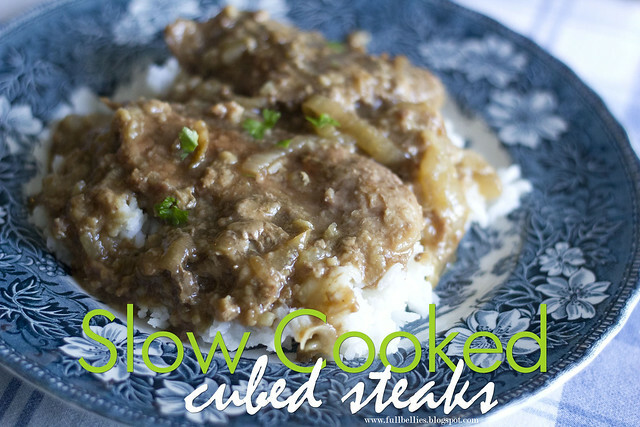 A few weeks ago, Mari from My Little Corner of the World, shared this yummy recipe on my Slow Cooking Thursday. I love cubed steaks and so it went on the next menu plan. It was a huge hit, very tasty and very simple to prepare. Give it a try and let me know what you think. Place flour in large, resealable plastic bag. Add steaks, a few at a time and shake until completely coated. In a skillet, cook steaks in oil until lightly browned on each side. Transfer to slow cooker. Add onion and 2 cups water. Cover and cook on low for 8 hours or until meat is tender. In bowl whisk together gravy mixes and remaining 1 cup of water. 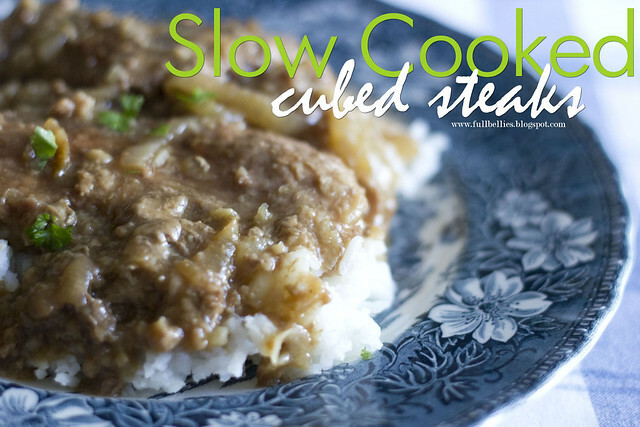 Add to slow cooker; cook 30 minutes longer. Super easy to make. Tastes wonderful.